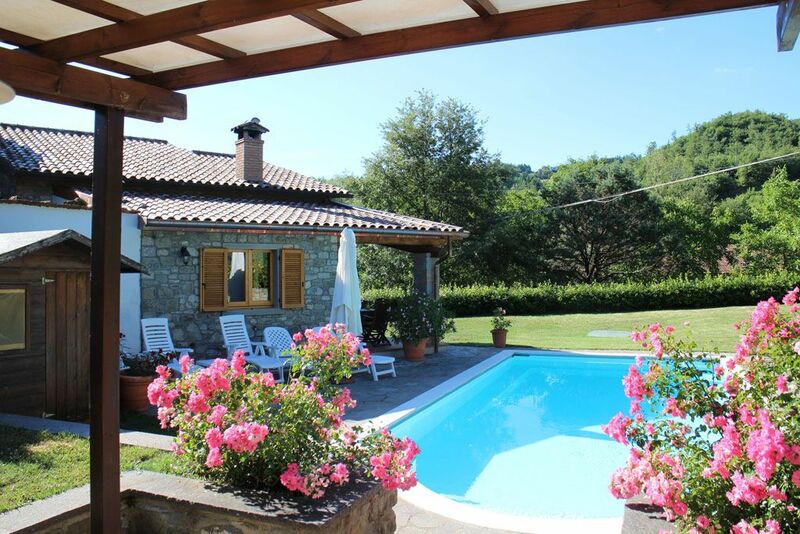 A stone built house with private pool and garden set within the village of Lama near Caprese Michelangelo. The house, being suitable for 4 to 6 people has 2 bedrooms, one twin and one double and a gallery overlooking the living room with double futon sofa bed. The living area is open plan with a fireplace with wood-burning stove, furnished with sofa seating, television, dining table and chairs, and leads out to the new kitchen and covered loggia extension built in early 2014 using traditional materials and methods. The kitchen is fitted with integrated appliances including dishwasher and washing machine and has double sliding doors leading onto the loggia with a built in all-weather barbeque and wooden dining furniture. The passage off the living area leads to the double and twin bedrooms each with views of the surrounding hills and to the bathroom which is equipped with a large rainshower, wc, bidet and basin. There is a desk in the gallery for anyone who needs to work. Externally there is a further covered seating area under the pergola with table and chairs, and loungers and umbrella are provided on the sunny stone paved pool terrace. The 8 m x 4 m swimming pool with Roman steps is for the exclusive use of the house. (Please note parents with young children that the pool is 1.8 m at the deep end). Within a few metres of the house is the ever popular Il Refugio restaurant and pizzeria specialising in rural Tuscan food. Also a few steps further is the Spar grocery shop, selling anything from local cheeses and hams to cement and hosepipe accessories! In nearby Caprese there is a selection of good restaurants, as well as shops, cafe/bar, laundry, banks, museum, etc with more excellent restaurants a little further afield. A list of restaurants is included in the guests information pack provided in the house. There are numerous walks in the area, including the national GEA trail, and routes are often way-marked and numbered and many of these can be started from the house. Some maps and directions are available for guests and guided walks can be arranged, charged locally. Within a couple of minutes walk from the house is a river where it is possible to swim. We have been visiting Tuscany for over 20 years and have always loved what it has to offer - stunning scenery, beautiful architecture and amazing food. We chose to buy this place partially because of the local area. There are fantasic local restaurants, stunning countryside and it is a gateway to many Tuscan / Umbrian destinations. Free wireless internet is available to guests- you will need a laptop, notebook or smart phone. By arrangement a computer can be made available. A wide-screen television (no TV tuner) and Bluray/ DVD is provided together with a bedroom television and DVD player. There is a desk in the gallery for anyone who needs to work and a washing machine in the kitchen and fold up drying racks provided.. Babysitting possible by arrangement, charged locally. Cooking lessons available on request, charged locally. Great location. Very good property. We had a wonderful time staying at the villa. If you want to relax during your vacation this is a beautiful place to do so. The villa is located in the little Italian village Lama, very quiet location but close enough to restaurants, grocery stores or attractions to visit. We are a family of 4, with two kids of the age of 10 and 12. Everyone loved the villa! The villa itself had the perfect size for us. It is very cozy and clean. The kitchen has a beautiful view into the garden, is quite big and offered everything that we needed. The outside area was superb and gave us lots of privacy. The pool was beautiful to cool off in and the grass area gave our kids enough room to run around while we sat at the pool or on the patio relaxing. We also grilled outside which was a big plus. There is a small grocery store close by (maybe 5 min. walk) which has a lot to offer. Our kids loved going there by themselves in the morning to pick up bread, eggs and whatever else we wanted for breakfast. The people there are lovely and even though our kids don’t speak Italian, they enjoyed every bit of interaction with them. There is also a restaurant you can walk to in 2 minutes. A lot of beautiful towns can be reached by car within 20-30 minutes. Caprese Michelangelo can be reached by foot as well. We walked up to it with our kids and enjoyed an amazing lunch at Buca Di Michelangelo. If you need anything while staying at the villa the manager of the property is very helpful. He has such a nice personality and had great suggestions when we asked for his help. A wonderful review that highlights all the things that we like about the house and surroundings. Loved the house - especially the pool. Perfect for our family. Lots of places nearby to visit for half day trips before getting back to the pool. Fantastic pizzas from the restaurant at the end of the road and a delicious meal in Boca de Michelangelo and great take away pizza from the end of the road. Glad our guest enjoyed their stay and some of the many fabulous restaurants around. We had a lovely time staying in the little village of Lama. The villa was absolutely perfect for what we wanted - a great place to relax and enjoy the sun & pool, and lots to do & see in the surrounding area. We visited the local restaurant a lot more than planned but that is a testament to the great food (especially steaks & pizzas! ), service, and value for money. Lesley was really helpful throughout the booking process with everything running perfectly before and during our stay. Would definitely recommend this place to others. A fabulous week spent in a lovely villa. It is very well equipped with everything you could possibly need for a family holiday. The villa description is spot-on and is a very high specification (notably the kitchen and bathroom). The pool is great for the kids (aged 10 and 12), if a bit chilly! Big enough to swim in as well as play! The local area is good to explore (Arezzo, Anghiari, Chuisi della Verna), so we did not go further afield to the larger cities. Local restaurants are great - the one at the top of the road (il Refugio) is really good, but can be a bit busy at weekends. We had a cooking session in the villa with the chef from Quele Donne bar which was reasonably priced and great fun - the kids joined in with gusto and ate everything! A really nice place to spend a quiet week away from it all in the Italian countryside! Located in Lama, a rural village in the stunning Tuscan hills a couple of minutes drive from Caprese Michelangelo, birthplace of Michelangelo. 20 min drive away is Anghiari one of the finest medieval towns in Italy, and a further 5 min takes you to the walled medieval city of Sansepolcro, a much overlooked Tuscan city, birthplace of Piero della Francesca. Arezzo, the regional capital is 45 min away and in the opposite direction a spectacular 15 min drive takes you to the Franciscan monastery of La Verna. This beautiful area in eastern Tuscany is in the centre of Italy and allows daytrip access not only to the popular tourist destinations of Tuscany (such as Arezzo, Cortona, Florence, Siena, Montepulciano, Chianti etc) but also those lesser feted but equally interesting destinations in Umbria (such as Perugia, Assisi, Orvieto, Todi, Gubbio etc) as well as attractions in Le Marche and Emilia Romagna. Rome is also feasible within a day but by train rather than car. Golf: Nearest golf course that we are aware of (as non-golfers) is in Poppi, another In Sinalunga beyond Arezzo and the beautiful Ugolino course near Florence. 25% deposit is payable on booking and the balance becomes due 4 weeks before arrival. Please note that the deposit is only refundable if and when those weeks are re-booked and deposit paid (less any applicable bank transfer charges). The charge for cleaning is included in the rental price. 20% discount for late booking within a 2 week period.